Marques de Murrieta is one of the most famous traditional winery of Rioja. In 1852 Luciano de Murrieta acquired the Ygay estate and named it "Château Ygay". Luciano de Murrieta introduced the barrique production in Rioja and was the first to bottle his wines in the winery. Because of his pioneering achievements the Spanish royal house gave him the title of "Marques". Since 1983, the Dalmau family is managing the estate. Vincente Dalmau's work began in 1996, when modern times at Murrieta were introduced, since the year 2000 the oenologist Maria Vargas is responsible for the production, which also brought a stylistic change to the wines. The very long barrel ageing, sometimes 20 years or more in old barrels, were stopped. Today mostly new wooden barrels are used at Murrieta and the barrel ageing time is significantly reduced, even the top wine Castillo Ygay is kept in the barrel for a maximum of 30 months to prevent the fruit from drying out. In the vineyards a much more careful work is now being done, a "green harvest" was introduced to reduce the yield and the grapes are harvested riper than before. As a result, the Murrieta wines are more juicy today, have more body and less acid than before, of course the influence of the new wood is also noticeable. 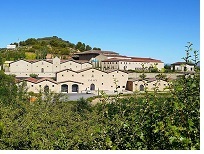 Nevertheless, Murrieta has managed to maintain a rather elegant Rioja style, which still makes the wines recognizable as typical products of the house.